Service and quality are what you'll find at Grand River Granite! At Grand River Granite, we know that happy customers lead to more customers so we put our best into every job. We don't take shortcuts to save money at your expense. With our experience, we can help you design a kitchen that is both stylish and functional. Our team of fabricators from Europe and the U.S. constantly produce a level of quality craftsmanship seldom seen in the industry. Nothing is more frustrating than poor service. Calls that go unanswered, meetings missed or deadlines past. Those are things that drive customers crazy. Your job is important to us so we make a point to do what we say and say what we'll do. 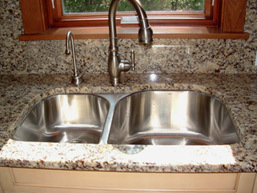 When you work with Grand River Granite, one person will take you through your project from templating to installation. If you have any questions or concerns, you have a contact ready to help and there is no getting lost in the office shuffle. We look forward to serving you.